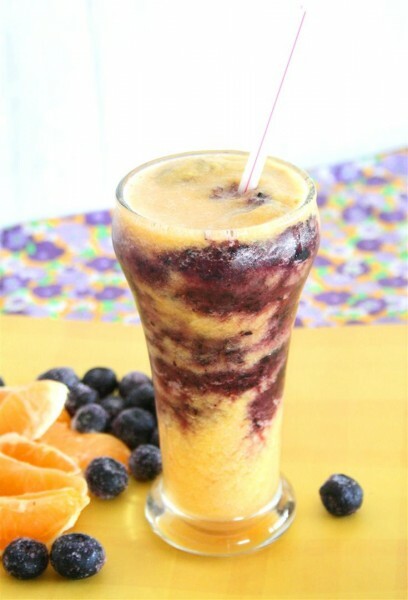 Blueberry Sunset Slushie was posted on March 19th, 2011 and is filed under Breakfast, Dairy Free, Drinks & Smoothies, Gluten Free, Kid Friendly, Recipes, Vegan. This entry has 4 comments. You can follow any responses through the RSS 2.0 Comment Feed. Oh, and just so you know, this recipe is still a little high in natural sugars (which are actually good for you), but it’s a good idea to balance this drink with a small protein snack to keep your blood sugars more stable. My excuse for protein with this drink was PB & J, which is probably pretty pathetic since the amount of PB on my toast was insignificant. Whatever. I give you permission to drink this any way you wish. It serves one, so double it up if you feel like sharing. *I left a bit of the white pith on the orange. This pith contains bioflavonoids which are great for you! Blend the orange, agave, and 3 ice-cubes together. Set aside in a cup. 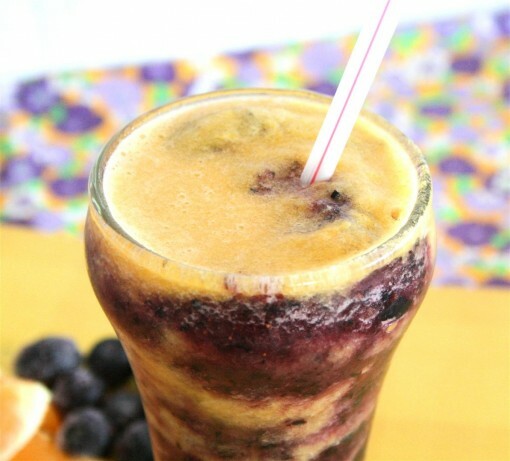 Whirl up the blueberries, syrup, and the rest of the ice together. Now layer the orange and blueberry mixture together in a pretty glass. Add a straw and pretend you’re in the Bahamas. Today: Something special is up today. I’m off to participate in a floor hockey tournament all day today, which should be fun. I have to say though, it’s retarded to get up like at 5:00 a.m. in order to get to the gym in time. I worked out hard the last couple days so I’m feeling really sore…hopefully I’ll get in the groove really quickly. Wish me luck! Is there some sinful recipe that you`d like to see me try to make a healthy version of? I’m contemplating buying a blender for the office so I can make slushies at work. I saw some golden raspberries today in the supermarket .. have you ever tried them? This is awesome! I love that you made a healthy slushie. This will be especially fabulous in the summer. Well done! Eugene~ No, I haven’t even seen them before. I’d love to try them though. If you get to try them before me, shout out and let me know what you think. Stephanie~ Thanks, I imagine once summer actually makes it’s way here I’ll be overloading this site with smoothie/slushie recipes. I’m such a blender crazed human.